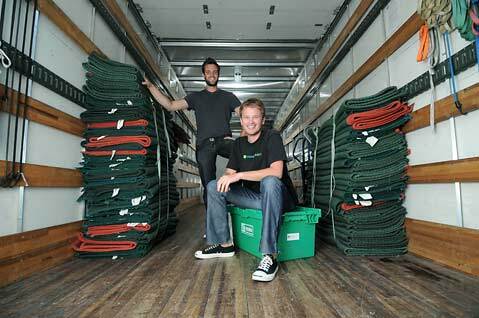 Movegreen's co-owners Patrick Wilkinson (left) and Erik Haney (foreground) founded the environmentally friendly moving company in December 2007. Apparently bigger is better when the readers think about property issues in this market of markets in sunny California. Reader loyalty may well be swayed by the fact that, according to Prudential, it has a 10 percent larger market share than its nearest competitor, which means there’s more choice and, as any Prudential agent will tell you, customer service begins with offering something more than promised land. Teamwork is important to Daniel Zia, who works for Prudential, which, he notes, is a large company. But they’ve managed to weather this rocky market-both company and agent-by listening to what the buyer needs. “I guess my philosophy and Prudential’s are the same: to put the client’s interest above our own. That way, we’ve made a lifelong relationship and not just a quick buck,” he said. 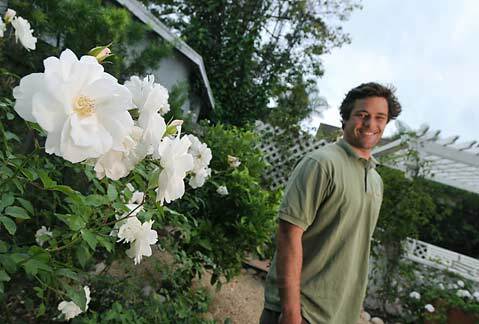 Here’s a first-ever appearance on our list of bests, though Erik Haney’s ecologically minded company has been moving with a minimum of shaking for just about two years in Santa Barbara. “I think it’s our dedication to be as green as possible mixed in with great customer service that got people to vote for us,” he said. Movegreen uses biodiesel fuels, plants 10 trees after every job, and reuses and recycles the packing materials and containers they use. “We’re very excited to win,” said Haney. Patterson Self-Storage is more than just a place to go when you’re downsizing-though there’s more than enough of that going on nowadays. This friendly, personable place is also where sports enthusiast store equipment from boats to model airplane parts, where wine-lovers can keep their superb vintages in temp-controlled circumstances, and, finally, in times of transition, a way to keep your best belongings like rare books and art safe while life sorts itself out again. The latest addition to the big-box Camino Real center way past the airport is Best Buy, a place where consumer electronics routinely are discounted. After the precipitous departure of CompUSA, the acquisition of gigantic television screens, computers, and other technological implements of life-enhancement briefly was left to long trips to Ventura or Santa Maria. No longer. Now you can finish that home entertainment system so you never again have to venture out into the harsh light of reality. But you could get a hot dog at Costco while shopping. Not to be confused with the nice little town just south of us, Carpeteria has long been the kind of go-to chain that lives up to its jingle-y TV advertising since 1979. Today, Carpeteria offers a Web site preview of all the different lines of carpet, tile, flooring, and linoleum coverings. It advertises low prices, and has a long reputation for carpet ends and scraps as well. Jason Downs operates Terra Cotta Landscaping on a smaller scale, meaning each client gets lots of extra attention. To limit them to cleaning is absurd. They do that, of course, ranging from helping with move ins and move outs to construction sites. Which, by the way, implies they’ll come clean your disheveled digs no problem. But they also do errands, elder care, and baseboards. So it’s no wonder that the readers vote for Silvia’s Cleaning Service year after year-messy bailout after messy bailout. For six years now, the folks at Naturalist were biding their time, growing a customer base who supports a more ecologically sound approach to cleaning what’s underfoot. Actually, they’ve been working very hard to expand a very loyal customer base. And now the moment is here, with a new hope for a cleaner America-sans both muddy and carbon footprints. If you sought a truly democratic forum in this town, you could do a whole lot worse than the Home Improvement Center at about 3 p.m. on any given Saturday. There, you would be likely to find men, women, people of every racial extraction, and most sexual preferences, too. Wealthy movie stars-Robert Mitchum used to frequent the place-as well as politicians, academics, journalists, and not a few professional gardeners and people in the building industry have been known to drop by. The reason they go there? Precisely because it is a gathering place like the Farmers Market is for foodie types-not necessarily the cheapest, but by far the friendliest, most efficiently assembled stuff we need. One reason for slight confusion may be the fact that Ed Steed, who bought the Tile Collection business two years ago, left the old sign up while remodeling the showroom floor. “We did this to bring a strategic level of design to Santa Barbara,” said Steed, whose Ventura store already had demonstrated to him the principle that even though the warehouses are full of varied items, the showroom should be edited enough to get customers looking in a narrowed-down area. And then, voil , the store can demonstrate its hidden holdings-as well as its many extras like trained designers and installers. “It’s ease of shopping plus value-added services that got the votes,” he said. When the time comes and people go off to make a home, they may settle for cartons and boards and bricks at college, but eventually the urge to coordinate transcends the mere need to nest. Pottery Barn has great sales, but good prices rule year ’round. The chain offers extensive computer registry when those wedding bells ring, and friendly service and lots of variety to help when all you need is some napkin rings to make that dinner party sparkle.